The United States has been embroiled in protests about police brutality especially against black men and seeing these pictures gave me an inkling of how different things could be. The most heart-breaking story of course is that of Tamir Rice. 12-Year-Old Tamir Rice was playing with a toy BB gun when someone called 911. One of the officers to arrive at the scene, Timothy Loehman, shot the boy within seconds of jumping out of the police squad car. He believed Tamir Rice had a gun, police say, and he thought the boy was 20 years old. However, this story out of Scotland UK, shows how messed up the American police's reaction was. This teenager, was holding a rifle, and yet police did not exchange fire with him, but were able to negotiate with him till he surrendered. This is the shocking moment a gun-toting teenager takes aim at a crack team of specially-trained firearms officers - minutes away from eliminating him. Only the professionalism and courage of police officers in Shetland stopped them shooting the 16-year-old. At the islands’ main court in Lerwick, Samuel Barlow admitted four charges of assault and one of abusive and threatening behaviour. Barlow had been spotted walking with a rifle near the Scord quarry on the outskirts of Scalloway on September 23, reports the Daily Record. Every available officer in Shetland was called out and a firearms unit flown in from Inverness. 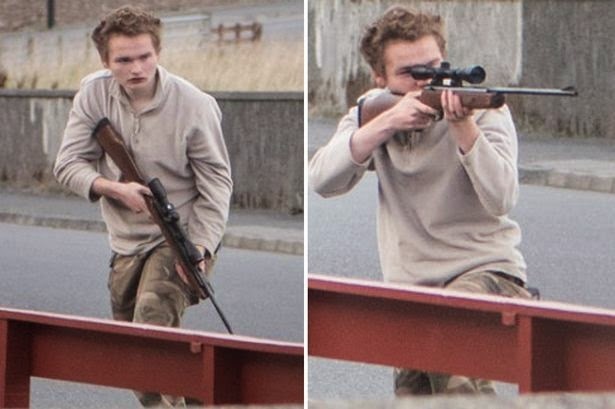 Barlow turned up at Lerwick’s Westerloch area threatening residents and levelling his gun at police officers who were trying to negotiate with him. Police, who initially had no idea what type of gun Barlow was wielding, had to hide behind a fire station building when Barlow aimed his gun at them. Duncan Mackenzie, prosecuting, told Lerwick Sheriff Court: “I am not sure if the accused appreciates how close he came to being shot by police. Barlow has been remanded in custody at Polmont Young Offenders’ Institution and will be sentenced next month. From the picture above, it's a white boy not a black boy. Let's wait till the gun holder's race is reversed, then we'll see how 'slow' the British police are at shooting a black boy. Or how well-trained they are at handling the type situation. Facebook Thinking of Adding A Dislike Button?